Have a suggestion for VRChat? A bug report? Check out the Canny! Have a suggestion for a feature in VRChat? You should check out the Canny! You can find it at https://vrchat.canny.io/. You'll need to create an account, or log in with a compatible service in order to post or vote. Once you've logged in, you can click on the applicable category. If you're reporting a bug, click on Bug Report. If you want to suggest a feature, click on Feature Requests. If you're in the beta, and have a bug report specific to that branch, click on beta_bug_report. If you find a suggestion/report similar to yours, you can upvote it! Click the little arrow on the left of the post. Clicking this arrow pushes it up in rank, and enough votes will get more attention. The top field is for the title, and should sum up your suggestion/report, and the bottom field is for a more wordy description. Try to be as detailed as possible, especially with bug reports. If possible, include screenshots of issues, or mock-ups of features. Any additional information is helpful! 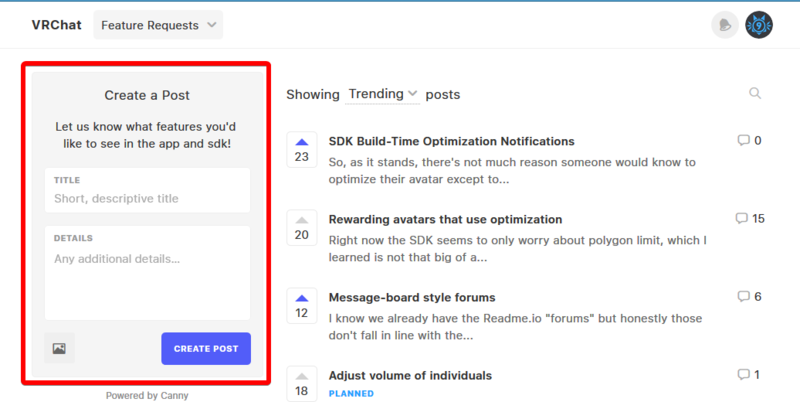 Once your issue is posted, you can edit it, delete it, or comment on it, just like any other post.